What Fishing Lines Do I Need For Fishing Offshore Miami? With so many different colored lines available, choosing the right tone can be a difficult decision. Our arsenal of rod and reel combos aboard the Blue Yonder are armed with a variety of different colored monofilament and braided lines. Depending on the different techniques we employ calls for a specific line and specific need. When we chase different pelagics such as sailfish and mahi mahi, we can expect long drawn out runs and brutal jumps with head-shakes in between. For this application the shock absorbing properties of monofilament definitely gives our anglers the advantage. Oftentimes when we target these species, well be hanging more than one bait behind the boat off of multiple fishing kites or outrigger halyards. To make sure we minimize tangles and see our baits, we like to use high visibility yellow 20lb & 30lb monofilament. Bottom fishing and wreck fishing rod combos on the other hand require a completely different set of needs to present baits in deep water. The sensitive bumps of feeding snapper and the hard pulling antics of deep water grouper and amberjack call for no stretch braided lines anywhere from 50lbs - 100lbs. We green braided line to fool these fish but sometimes extra long monofilament leaders help to get bites with hi - vis colors. Regardless of where you fish, remember that your line decisions will help you get more bites and land more quality fish. These are just a few of the different advantages we look for when trying to get our clients hooked up. Night Fishing In Miami- There are plenty of fish to catch at night in Miami. Check out our article on Miami Night Fishing. 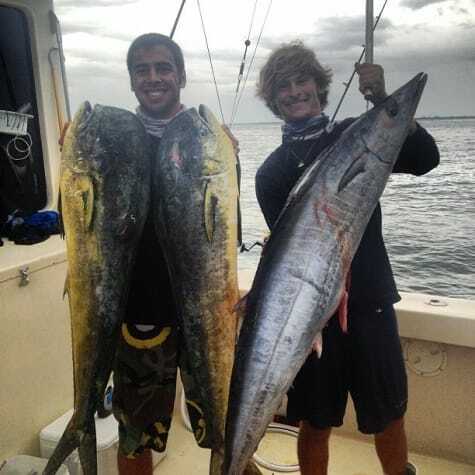 Winter Fishing In Miami- Winter is one of the best times to fish in Miami. We throw up our kites and put a hurting on the fish including sailfish, kingfish, tunas and big mahi.